This Wednesday, 4/11, at 6:30 pm in Crawford 169 is the seventh and final Cinematheque screening of the semester. Lauren Russell (M.F.A. 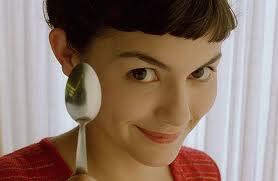 student, poetry) will present Amélie (2001), the fifth in our ‘Anthropomorphism‘ series. About ‘Amélie’ (from ‘Netflix’): When impish gamine Amélie (Audrey Tautou), who lives alone, finds a long-hidden trove of toys behind a baseboard in her apartment, she’s inspired to repatriate the items, an impulse of generosity that sparks more benevolent acts. A celebration of life and love, French director Jean-Pierre Jeunet’s Oscar-nominated charmer stresses the importance of small wonders that surround us, if only we paused to look. How to get to Crawford Hall from the Cathedral of Learning: Exit the Cathedral of Learning towards Fifth Ave. Take a right on Fifth Ave. Turn left on Tennyson Ave. (between Alumni Hall and Clapp Hall). Pass Clapp Hall and Langley Hall on your right. The building immediately after Langley Hall (and also on your right) is Crawford Hall. P.S. Free pizza!